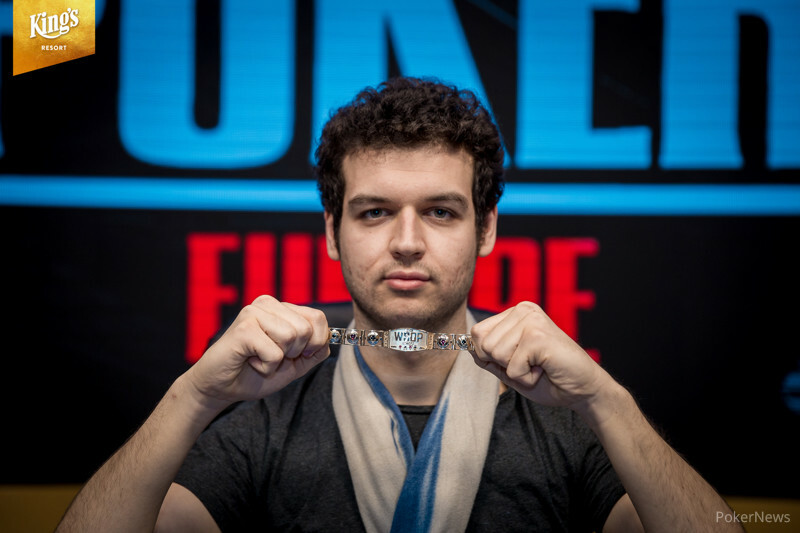 The 2018 World Series of Poker Europe has crowned another bracelet winner in the early morning hours and gears up for the final two bracelet events in Europe's biggest poker arena at the King's Casino in Rozvadov. Another record field emerged thanks to 133 total entries in Event #8: €25,500 No-Limit Hold'em Super High Roller and the guaranteed prize pool was more than tripled. Australia's Michael Addamo and Germany's Christian Rudolph battled until almost 6 a.m. local time. A series of double-ups at the very end made for a rollercoaster experience with the better end for the Aussie and he recorded his best result on the live circuit for €848,702. Addamo came fresh off winning his first gold bracelet this past summer in Event #24: THE MARATHON - $2,620 No-Limit Hold'em for $653,581 and the final day of the event turned into yet another marathon session. Heads-up opponent Rudolph reached his third WSOP final table in two years and narrowly missed out on his maiden bracelet, but collected a consolation prize of €524,532 for his efforts. The 2017 WSOP Main Event 3rd place finisher and last year's runner-up of this very event, Benjamin Pollak, had to settle for third place this time around. 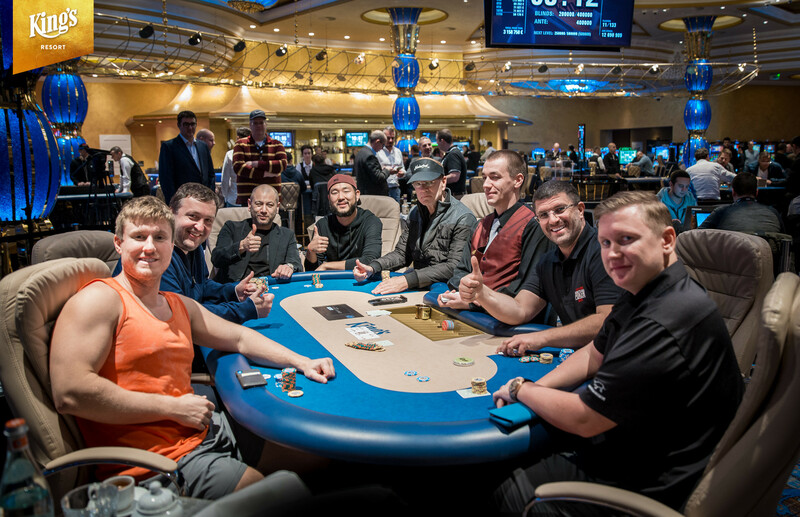 Among the other finalists were Mikita Badziakouski, four-time WSOP bracelet winner Dominik Nitsche, Winfred Yu, James Romero and German High Roller regular Manig Loeser. “I definitely gonna catch up on some sleep now,” a visibly exhausted Addamo said in the interview with Czech media. Having just arrived at King's Casino prior to the start of this event, Addamo bagged the chip lead on Day 1 on a couple hours of sleep and went on to add a second WSOP bracelet to his collection. With this victory, Addamo will boost his cashes on the live circuit to more than $3 million and becomes the third Aussie to win multiple bracelets. Following into the footsteps of Hanh Tran and Timur Margolin, he also becomes the third player in just eight events at the 2018 WSOPE festival to win a WSOP bracelet in Las Vegas and Rozvadov in the current year. 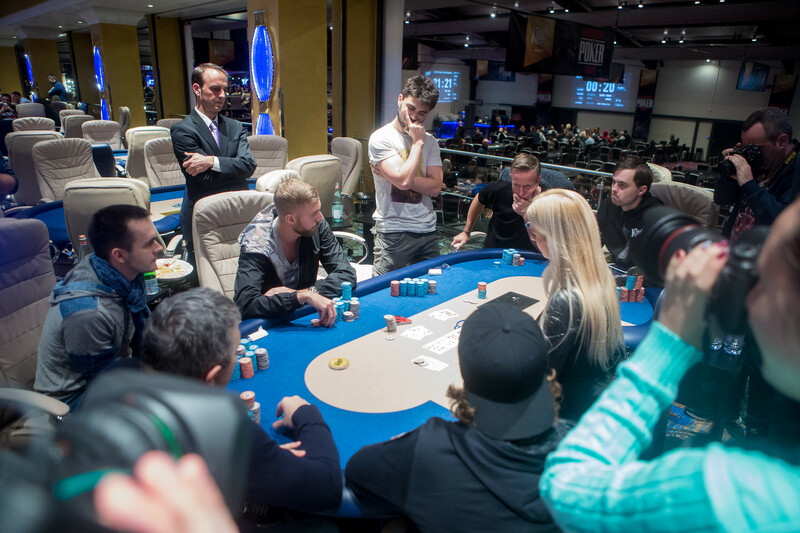 Right in front of the stunning feature table set in Europe's biggest poker arena, an explosive high-stakes cash game session was running with an explosive line-up. King's Casino owner Leon Tsoukernik and “Aussie Matt” Kirk had already squared off in enormous pots previously, and they were this time joined by Tony G, Ben Lamb, Rob Yong and four-time WSOP champion Bobby Baldwin. The game of choice was pot-limit omaha with blinds of €1,000/€2,000. Hundreds of thousands of Euros will also be at stake in the next highlight of the festival as Day 1 of the €100,000 King's Super High Roller is just around the corner, certain to attract some of the biggest names of the international poker circuit. Whether or not Addamo will be taking a shot at a third bracelet in 2018 remains to be seen. Even before any cards were dealt on Day 2, the €25,500 High Roller had surpassed the 113 entries of the previous year and another nine new entries boosted the field to 133 entries in total, making it the biggest High Roller of that buy-in in Europe in the current year thus far. The prize pool of €3,158,750 more than triple the initial guarantee, and the top 20 spots were set to see a return on their investment. Among the early casualties were Liv Boeree, Michael Soyza, 2013 WSOP Main Event champion Ryan Riess, Adrian Mateos and Christoph Vogelsang. Riess lost a flip with pocket jacks against the ace-king of Manig Loeser, who immediately spiked a king on the flop. 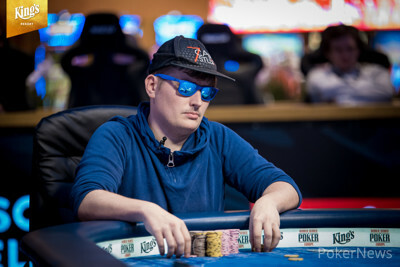 It wasn't a lost day for Riess, however, as he jumped into the €10,500 Turbo High Roller and defeated Ognjen Sekularac in heads-up for €178,582 in a field of 56 entries. Many other regular faces of the European and international High Roller circuit were still in contention including former WSOP bracelet winners Igor Kurganov, Johannes Becker, David Peters, Chris Ferguson and defending champion Niall Farrell. However, none of them made it to the money. Farrel was eliminated just before the three-table redraw when his jam with seven-six suited was called by Fabrizio Gonzalez out of the blinds with ace-jack. Gonzalez turned a better pair and rivered the nut straight for good measure. Two-time WSOP bracelet winner Kristen Bicknell was ousted just shy of the money bubble when her king-nine failed to connect with the board against the pocket jacks of Rainer Kempe. The money bubble then burst in spectacular fashion on the outer tables. Manig Loeser jammed into Gonzalez in a battle of the blinds and the Uruguayan called for 26 big blinds with ace-jack. Loeser only held ace-deuce, but a deuce on the flop left Gonzalez empty-handed. Gianluca Speranza, Sylvain Loosli and Pavel Binar ran out of chips before the next redraw and Czech master of speech play Martin Kabrhel fell in 16th place. Joni Jouhkimainen failed to hold up with ace-ten suited and the flopped nutflushdraw, as Mikita Badziakouski got there with ace-six when he missed out on the open-ended straight draw and rivered a six instead. Swiss businessman Asaf Berman, Rainer Kempe, Vladimir Troyanovskiy and Jean-Noel Thorel all missed out on a spot on the final table. Troyanovskiy was all in with ace-king suited against the pocket kings of Rudolph and flopped an ace, but the case king appeared on the river. The field combined after an even more spectacular three-way all in on the outer table. Timothy Adams was poised for a triple up with pocket kings against the queen-jack suited of Matthias Eibinger and the pocket queens of Benjamin Pollak, but the last queen appeared on the flop to deny the Canadian a second WSOP bracelet for now. 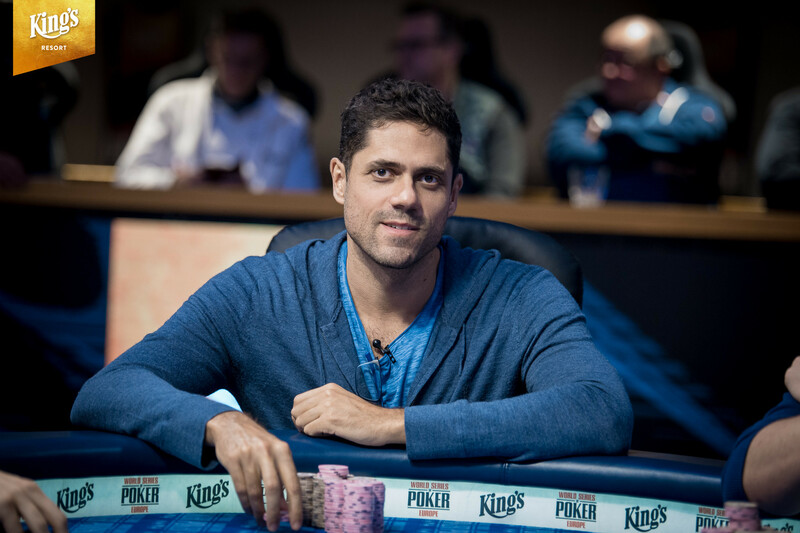 After the double knockout on the final table bubble, Pollak throned at the top of the leaderboard with almost two times as many chips as Christian Rudolph in second place and the remainder of the field had very similar stack sizes. Manig Loeser was the first to bow out when he open-shoved with king-eight out of the small blind. Winfred Yu looked him up out of the big blind with ace-eight suited and flopped top pair. Loeser had some outs with a gutshot, but ultimately found no help to become the first casualty. Rudolph, who had been responsible for several eliminations on the feature table previously, continued his run-good and sent James Romero to the rail next. Romero ended up all in and at risk with ace-ten, but Rudolph had little to fear with the dominating ace-queen on a nine-high board. The action didn't slow down as two further players were eliminated in quick succession. In a three-way pot, Winfred Yu flopped the nutflushdraw and went with it only for Christian Rudolph to snap-call with pocket nines for top set. Yu turned an additional straight draw, but the river was a blank. Dominik Nitsche, who won his fourth WSOP bracelet in Rozvadov one year ago in €111,111 No Limit Hold'em - High Roller for One Drop, also fell victim to the hot run of countryman Rudolph and lost a flip with ace-jack against pocket eights. What followed was a stalemate that turned into an endurance challenge until the early morning hours. Fortune favored Michael Addamo when he was at risk preflop with king-nine suited against the ace-jack of Benjamin Pollak, as the Aussie flopped a full house. The run-good of Addamo continued when he took on a short-stacked Mikita Badziakouski with ace-trey versus ace-five suited thanks to trips on the flop. Addamo nearly got there from behind for the third time, but missed out on a wheel draw to double Rudolph with ace-trey versus ace-jack. Only a few hands later, Benjamin Pollak was at risk with ace-queen suited against the pocket sevens of Addamo and ended up second-best to set up a nearly even-stacked duel for the gold bracelet past 4 a.m. local time. Rudolph pulled away at the start but Addamo doubled into a commanding lead when he rivered a nine-high straight against the flopped six-high straight of his opponent. The fate of Rudolph seemed all but sealed when he was at risk right after with ten-five against pocket queens, but the German made two pair on the river. A series of double ups for both players followed and eventually, it was a simple coin flip that decided over the final outcome of the tournament. Addamo held pocket fives and Rudolph was at risk with ace-seven. Memories of the 2014 EPT Barcelona Main Event final table with the infamous German rail and their “the seven always comes” returned, but this time no seven nor ace for that matter showed up to crown Addamo as the champion. That wraps up a late night shift here at King's Casino in Rozvadov, but the penultimate event of the 2018 WSOPE is just a night's sleep away. Christian Rudolph shoved on the button and Michael Addamo snap-called. They both got up from their chairs to see the cards go on their backs. The German rail shouted: "A seven is always coming!" The flop came for Addamo to stay ahead with the pair of fives. The turn was the for Rudolph to now pick up some extra outs to double up if an ace, seven, or queen would come. 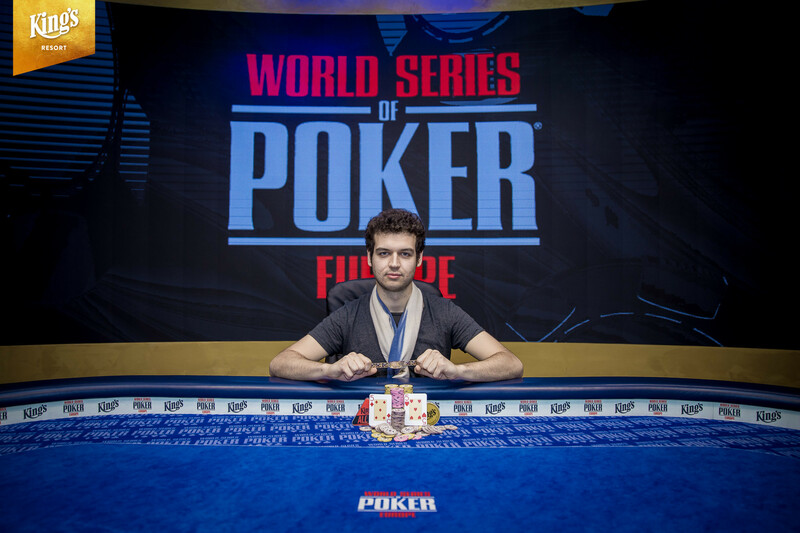 The river completed the board with the for Addamo to stay ahead and finally eliminate Rudolph in second place for €524,532 and award Addamo with his second WSOP bracelet and the first-place prize of €848,702! Michael Addamo just called on the button with and Christian Rudolph jammed all in for 29,200,000 with in the big blind. Addamo snap-called to try once again, to bring an end to this heads-up match. The flop came and Rudolph was in a great position to find a double up. The landed on the turn providing some chop outs but Addamo's outs to win outright were narrowed with Rudolph picking up a flush draw. The river was the to put a seven-high straight on the board and the two players took their chips back. It all went in again when Michael Addamo shoved from the button and Christian Rudolph called. The flop came , Addamo just shook his head as the double-ups just didn't seem to end and Rudolph flopped a pair of treys. The turn was the to now give Addamo the gutshot to the straight but the on the river ensured Rudolph would double back up. Michael Addamo limped in on the button with and Christian Rudolph raised to 9,200,000 with in the big blind. Addamo called with the suited connectors in position and the flop came . Rudolph flopped two pair and led out for 6,300,000. Addamo just called with his flush draw and the landed on the turn. Rudolph announced all in and Addamo instantly called off his 41,900,000 after making a flush. The river was the and Addamo found himself a double up to take back a commanding chip lead. Christian Rudolph limped in on the button and Michael Addamo shoved for Rudolph to make the call. The flop came for Addamo to flop a straight draw but keep Rudolph ahead. The turn was the to not change the situation and the on the river meant Rudolph would double up for the third time in a row to take over the chip lead. Christian Rudolph ripped all in for 12,000,000 on the button with and Michael Addamo made the call with . Addamo held the stronger hand but Rudolph had two live cards. The flop came to keep Addamo in the lead who was looking to end this grueling heads-up match. However, the on the turn gave Rudolph the lead with a pair of queens. The river was the and Rudolph extended the match. Michael Addamo limped in on the button and Christian Rudolph opted to check his big blind. The flop came and Rudolph shoved for Addamo to snap-call. "Don't worry, it's finally done," Rudolph said. Addamo held the overpair while Rudolph was sitting on the pair of fives. The turn was the which didn't change the situation but the on the river gave Rudolph the two pair to double up.